Marlin is not slow, or mute; what he is is a stutterer, and that makes it impossible for him to convince people otherwise. What he is also is a Rackham: the youngest son of the world-famous explorer Roland Rackham, who is the owner and proprietor of the Zoo at the Edge of the World, a resort where the well-to-do from all over the world can come to experience the last bit of the wild left in the world at the end of the nineteenth century. In order to impress a powerful duke who comes to visit the zoo, Marlin's father ventures into the jungle and brings back a mysterious black jaguar, now the only one in captivity. Everyone is terrified of the jaguar, including Marlin—until one night, when the jaguar confers upon him a powerful gift. Soon Marlin finds himself with a difficult choice to make and, finally, something to say. If only he can figure out how to say it. About the Author: All of my books have been inspired by my life. My first novel, The Bully Book, is a a comic mystery taken directly from my experiences being bullied in 6th grade. 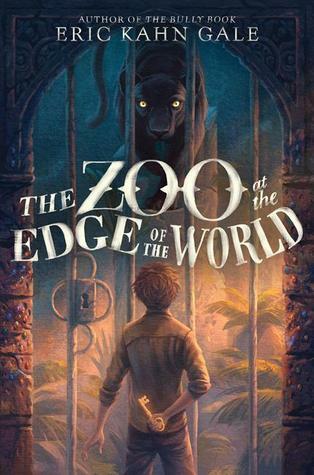 My second, The Zoo at the Edge of the World, is a fantasy prompted by my lifelong obsession with animals. And my newest book, The Wizard's Dog, is what I imagine my lovely dog, Bowser, would be like if he was granted magic powers. Life has enriched my books, and these books have vastly enriched my life. My Review: I enjoyed this book a lot more than I had expected to. The illustrations for this book are absolutely stunning! It was a very quick and exciting read. Though it was a lot darker than I was expecting. It’s about a young boy discovering his self-worth, and learning to stand up for himself. The main character doesn't talk because of the bullying he receives because of his stutter. My only complaints are that the romance didn't need to be in the book at all and it wasn't long enough! I definitely recommend it.